On the Orrery (the artificial solar system ship) the alarm blares as Invictus awakens in the sun. 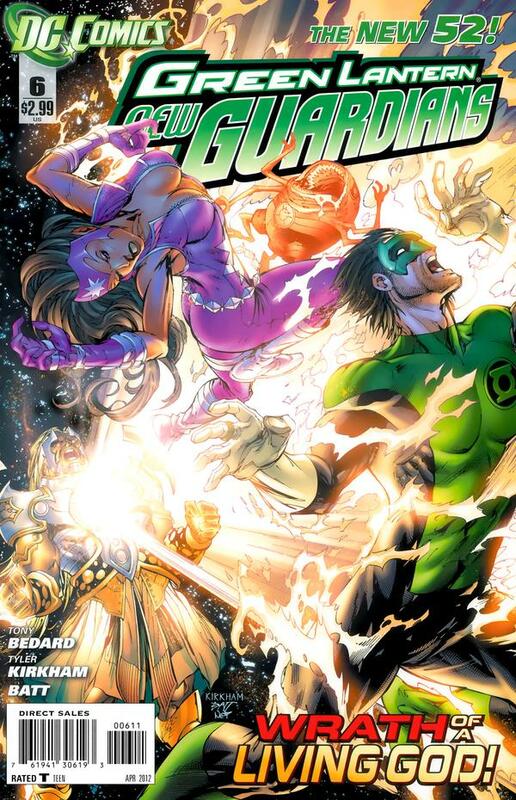 Kyle Rayner tries to contact the other Lanterns but can’t because their rings operate on different emotions. He still manages to eventually tap into all his emotions to warn them before the Angel attacks. He catches Fatality and Munk unprepared and quickly breaks through their defenses. Before he can finish off Fatality Munk teleports them to the Blue Lantern’s location. The angel shows up and easily trashes them; the arrival of Kyle doesn’t help as Invictus is clearly more powerful than each of them individually. Just then Red Lantern Bleeze arrives in search of her friends. Art- Instead of gushing as usual I’ll just say Kirkham does his usual top notch job on the interior arts. Action- Archangel vs the New Guardians across a galaxy spanning spaceship made up of different self contained planets? Yes please! Cover- Gorgeous as always courtesy of Kirkham; it shows Kyle, Fatality and Glom being blasted by Archangel Invictus, Colors are as dynamic and stunning as ever! Characterization- I’m very impressed at the little touches the writer has managed to squeeze into fatality. 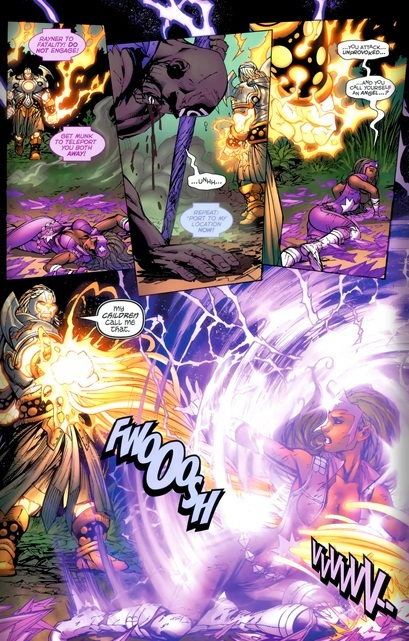 After her star sapphire conversion she lost allot of her old charm, the very reason I loved her initially. Here she has returned to her hunter ways, preference of weapons, needing enemy statistics before engaging etc. Finally someone who understands the subtle nuances of writing a woman who has simply had the emptiness and vengeance in her heart “filled”; She’s the same girl just no longer limited by the need to just “kill green lanterns”, kudos all around for the return of one of my favorite villains! Kyle continues to be “different” than a typical Green Lantern, this time he tapped into the whole emotional spectrum to contact his team when he shouldn’t have been able to. 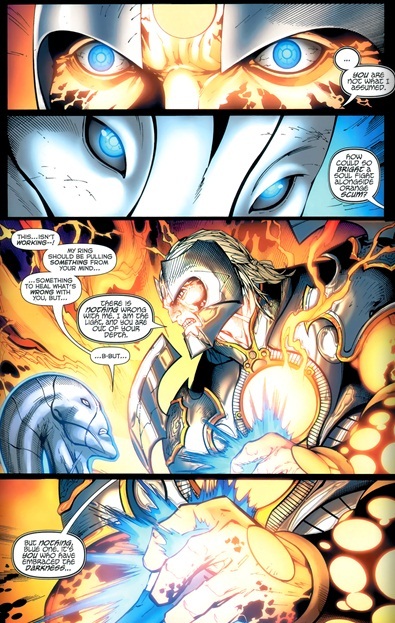 Saint Walker is as his name suggest while Arkillo is a big brute. All around solid work on all involved. Continuity- Red Lantern Bleeze returns this issue having had her intellect restored, this happened in the early issues of Red Lanterns, nice to see it acknowledged here. Ending- Seriously Bleeze arriving was how this otherwise cool book ended? I’m not excited what could she possibly do that the others couldn’t? Villain- Sure he’s intimidating but seems cliché by green lantern standards by now, a big brute was powers? We get one of these every few months!